Interview with Cheese lighting designer, Josh Pharo. Cheese is certainly a play with difference. Powered by the public on energy generated on specially designed gym bikes, it tells the story of the financial crisis and environmental justice through comedy. I managed to catch up with the busy lighting designer for the production, Josh Pharo, to find out about the challenges of working with a fixed energy budget, the beauty of light and the importance of technology for a greener future in theatre. “I don’t think there is a [environmental] culture in theatre making, or there hasn’t been one until the last couple for years, but personally I have been brought up in a very environmentally conscious way. I think I was part of generation that was educated, or starting to be educated, about environmental impacts”, says Josh of his interest in sustainability and theatre and his excitement to work on Cheese, directed by fanSHEN. Josh has been working in theatre lighting for ten years, first training as a theatre technician, then studying lighting design and theatre practice, where in addition to theatre he gained experience in opera, drama, music and architecture. He has been working as a freelance theatre lighting designer for three years and is keen to pursue more projects that combine his passion for lights and his concern for the environment. 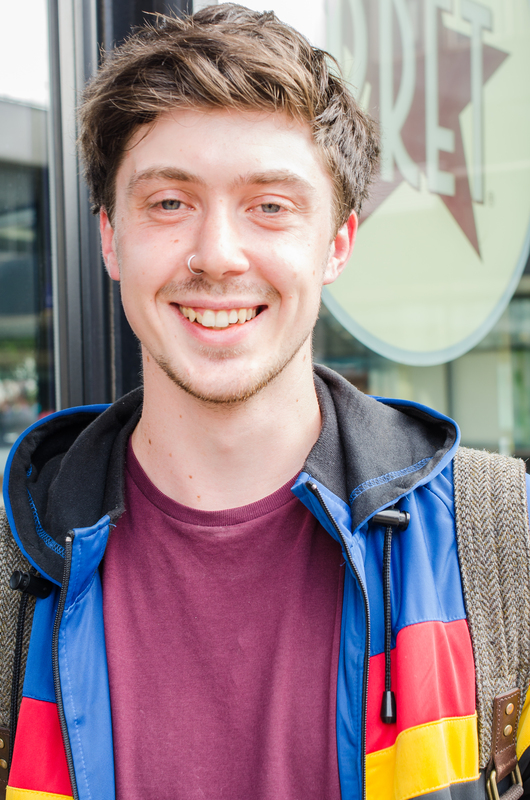 He first learnt about fanSHEN and the play, Cheese, when working at Ovalhouse. It was here he met Rachel Briscoe, creative director at fanSHEN, who approached him to ask if he wanted to design for Cheese. “When I first heard about the play I was really interested in its approach to exploring the financial crisis through a farcical and comical lens. I have seen some very serious productions about the crash and I don’t think they have much impact – we all know how serious it is and something that is much more farcical and comedic has a much darker undertone”. He puts the lack of theatre’s engagement with environmental issues and sustainability down to the pressures that theatre productions are under, “they are often working to create something to a tight budget and within a tight time frame, where the artistic journey can be sporadic and the environmental impact becomes that last thing that is considered”. He thinks that there is also an argument and artistic feeling that theatre is about presenting something that is beautiful. Although using lots of energy isn’t the only way to achieve this, Josh believes that there is something about using the beauty of light in theatre “you [the audience] don’t want to feel that you’ve gone to Piccadilly Circus and there is that horrible light quality! In the past people [working in theatre lighting] didn’t really worry about how much power it used, they just wanted to find that beauty. I do think that’s changing, but it hasn’t become part of mainstream practice yet”. As well as creating a cultural shift within theatre, technology and research are at the heart of the issue “if you can prove to lighting designers that it’s the same product, or equally as good a product, for less energy then that’s a great argument”. For those working in lighting it’s more than a job, they really appreciate working with the material of light, “it’s all about the quality of the light”. Driven by changes in technology the lighting industry does seem to be changing culturally however, “there is this huge trade show, Plasa, and the look of that trade show has changed so much. Everything is about saving energy, where as that wasn’t even discussed when I first started out. It’s been really interesting to have observed that shift. It’s the polar opposite of 10 years ago”. Josh is hopeful that a low energy approach to lighting will become more mainstream in theatre as the technology develops, “we can do the same with low energy lights but we need to find the right way”. The famous National Theatre in London, has worked hard to reduce its energy consumption both on and off stage. Switching the external lights on the building from discharge lamps to LEDS, has reduced the energy consumption by 70%. In addition to working with the low energy budget, Cheese is being performed on in non-theatre location, old office space on Oxford Street. This offers up another set of challenges in terms of lighting, “being an office space has totally changed our approach to the piece, which I think is really exciting. If we are to stage this in a conventional theatre you would have a blank canvas to work from and there are endless arrays of contexts to work from. This way our frame of reference is an office…the design we are going for is challenging the context of the office space all the time and making it farcical and surreal”. Josh is keen to make the whole of lighting process environmentally friendly, not just in terms of energy use, and is thinking carefully about how best to do this within budget. For example, though more expensive it would be better to hire the lights, to avoid waste; equipment such as lights are often thrown away due to the limited time recourses needed to organise alternative disposal. At present Josh is working out what he terms the “languages of the lights”, planning out the practical side and the artistic element. It’s a busy and important period where big decisions are made that are hard to go back on, but that does not seem to faze him too much. Instead he focuses on his passion for lights and in creating the sublime “one of the things I really like doing with lighting is trying to find the beauty of quite an ugly source and thinking about how to get the most out of that. Low energy lights can be uglier, so trying to find a way to make it beautiful is both challenging and interesting”. Previous post ← Locations, locations! ‘Track your progress graphs’ all up and big thanks! One day left at Whitechapel Sports Centre! Pedalling Power now in Whitechapel!